Most of the time it’s not a good thing to have your bubble burst. Quinta Mazatlán, however, is encouraging it. Burst your bubble — and more. 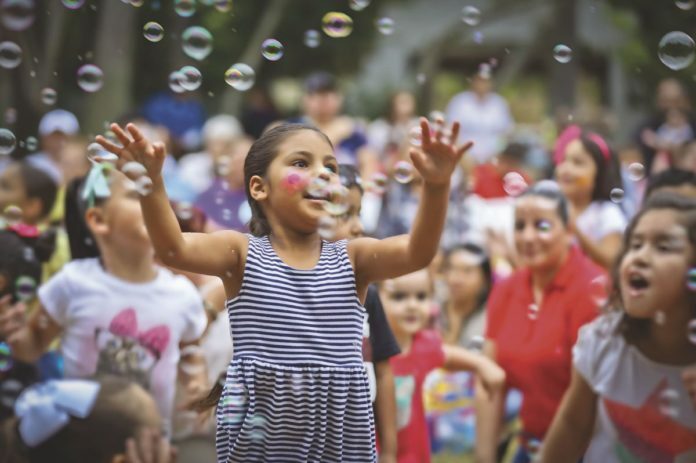 The Quinta Mazatlan World Birding Center will hold a “Bubble Concert” at 7 p.m. Thursday, Aug. 2, at 600 Sunset Drive in McAllen. It is one of several events taking place at the historical facility and grounds as summer winds down. The event is an outdoors interactive show filled with music, singing and bubble blowing (and bubble busting, of course). Families are encouraged to bring their own bubbles, chairs and blankets for this unique concert, led by Joe McDermott. McDermott has been obsessed with music ever since he was a child — the youngest of eight children — growing up in Chicago. While he learned to play guitar and played in rock bands, he moved to Austin and earned a Fine Arts degree from the University of Texas. Hoping to make it in the art world, he took a job as an art teacher at Athena Montessori. Five years later, he opened his own preschool. During this time, he began songwriting and singing. Soon Joe realized that children were an unending source of inspiration for songwriting and has been singing ever since. Family Summer Nights take place from 7 to 8 p.m. every Thursday through Aug. 31. Park admission is $3 per person, which includes the program and no advanced reservation is required. Amazing, Greg. Wait, that’s Amazing Greg! One of Texas’ favorite children’s performers makes a stop at Quinta Mazatlán on Aug. 9. With quick wit, magic and comedy genius, Greg’s show is only surpassed by the amazing animals in his menagerie. His Safari night performance travels the country and he performs more than 400 shows per year and was named Favorite Party Entertainer by Parent Magazine’s Best of the Best Awards. Amazing Greg is no newcomer to the industry, having performed for more than 20 years. Quinta Mazatlán officials are already forecasting it as one of the summer’s favorite shows. Ack! Spiders! How about 600 of the little buggers in one apartment? Don’t be scared. Just crawl over to the Live Spiders show and discover the important role spiders play in everyday lives — including being used to scare people (ok, maybe not that part). 30 years of experience working with spiders. In fact, at one time he had 600 spiders living in his apartment. Children and teens from the Lower Rio Grande Valley (LRGV) who took part in the Valley Land Fund 10th annual Southern Exposures Youth Nature Photo Contest will be lauded for their work on this night. 7 p.m. Thursday, Aug. 23 and participants will their images on a big LED screen outside. There will be cash prizes, free Southern Exposures T-shirts for all contest participants, snacks and fun. Photos were submitted to the Valley Land Fund and focused on nature within the LRGV. Quinta Mazatlán held both professional and amateur photography workshops in June and July to allow children and teens to explore their capabilities. It was an excellent opportunity for our youth to learn about nature and photography. Sponsored by the Valley Land Fund through the generous support provided by the Robert L. Townsend Endowment fund in association with Quinta Mazatlán. For more information on events, visit http://quintamazatlan.com.